A sold sign is pictured in the neighbourhood of Glebe in Ottawa in 2016. You could be forgiven if you've paid no mind to Ottawa's real estate market as the action in Toronto and Vancouver has stolen the headlines. But those in the know are already seeing Canada's capital as a market to watch in 2018 and beyond. Bank of Montreal Senior Economist Robert Kavcic wrote the Ottawa real estate market was "about to break out" last July and, according to recent statistics from the Ottawa Real Estate Board, the market – long known as a conservative one buoyed by steady government employment and a reliable economy – has done just that. "Fundamentally, things are playing out pretty well as we would expect," Mr. Kavcic says. Ottawa's real estate market is one of Canada's strongest and steadiest. There were 17,803 homes sold in Ottawa in 2017, an increase of 10 per cent over 2016. The condo market had a 22-per-cent increase in sales year over year. By comparison, sales of condos in Toronto decreased by 9.6 per cent, while its overall residential sales market decreased by nearly 20 per cent – although both numbers compare with a record-breaking 2016. Both Toronto and Vancouver have seen their markets impacted by a new foreign-buyer's tax. Ottawa does not have that. In addition, the new stress test on mortgages for new home buyers will likely have less of an effect on Ottawa buyers, Mr. Kavcic says. "In the GTA detached market you probably have quite a few marginal buyers who are really stretching to get in, but those are forced down the price ladder, now having to qualify two points higher," he says. "In a market like Ottawa where affordability isn't nearly as stretched, my sense is – with the exception of a few buyers at the margin – there's a lot more wiggle room in terms of qualifying. Especially in the condo market where we're starting to see more momentum and affordability is a lot more prevalent that in other cities." The average condo price in Ottawa in 2017 was just more than $269,000, which was an increase of 3.4 per cent over 2016. However, compare that with the GTA's average condo price of $512,478 – essentially double – and there's an opportunity for young buyers to get into the market in Ottawa. The tight rental market – the Ottawa vacancy rate is currently 1.7 per cent – is also nudging people into purchasing homes. "We're seeing millennials come in to the market, rather than renting," Ottawa Real Estate Board president Ralph Shaw says. "Our rental market is so tight, so the young people are picking up the smaller, affordable condos." Mr. Shaw points to the federal government as a steady employer helping to keep the market strong. Ottawa's technology industry is also booming; online retailing software developer Shopify, with a $15.4-billion valuation, recently announced plans to triple the size of its Ottawa headquarters. Major retailers are also flocking to the city, with Whole Foods, Tiffany and Co., Nordstrom and Sporting Life all announcing expansion plans. "[The market] has a lot of stability with the federal government. They do go in waves but they're a pretty stable employer. The technology companies right now are strong. The construction industry is strong," Mr. Shaw says. "All the main driving forces are active right now." Affordability has certainly propelled the market – almost 10,000 of the residential units sold in 2017 in Ottawa were less than $500,000 (Canadian). Ottawa's luxury market is also booming. Of all the homes sold in Ottawa last year, 257 were valued at more than $1-million, versus 155 in 2016. Meanwhile, 25 condos were sold more than $1-million versus just nine in 2016, according to the OREB. Marilyn Wilson, owner of Marilyn Wilson Dream Properties Inc., sold the highest-priced home in 10 different Ottawa neighbourhoods in 2017 and 53 per cent of the homes more than $2-million. She says Ottawa has always been known for its stable real estate market and that is comforting for buyers. "We have been extremely busy in December and January and we are seeing a demand for good homes in various neighbourhoods across the city," Ms. Wilson says. "We are also seeing a demand for luxury condos, and we sold more luxury condos last year than we ever have. This is a wonderful time to invest in the Ottawa marketplace. There is a demand for good properties. Prices will continue to be strong for properties that are turnkey and properties with beautiful lots." MoneySense magazine named Ottawa as the No. 1 Place to Live in 2017 and Ms. Wilson says there is national recognition that Ottawa offers one of the best living environments in Canada. She says buyers who are looking to cash out of inflated markets such as Toronto and Vancouver are coming to Ottawa. "You can live very well in Ottawa," she says. "The choice to move to Ottawa from these markets is often driven by either a desire to upsize by people who are priced out of their local markets or a desire to cash in on their home's equity." Foreign buyers also have their eyes on the capital, according to Ms. Wilson. "Though we have always had international buyers, we are seeing more and more of these as many international buyers who are now priced out of the Vancouver and Toronto markets are coming to Ottawa," she says. Between condos and townhomes, affordable detached homes, or luxury properties in Ottawa's can't-miss neighbourhoods such as Rockcliffe Park, the Glebe, or Westboro, the appetite for homes has been a boon on the capital's construction industry as well. Developers launched more than 7,400 housing projects in 2017, the highest number in more than a decade according to the Canada and Mortgage and Housing Corp., marking a 41-per-cent increase from the year before. "[The condo] inventory [has been] growing dramatically the last few years. There was a slow down but there's been a strong recovery in the last 18 months … 12 months in particular. There's a bit of social engineering going on with the light rail. Municipal government is encouraging high density, making it a priority," Mr. Shaw says. "That's an incentive for builders to take on those projects." Ottawa's new light rail project, The Confederation Line, will connect Blair Station in Ottawa's east end to Tunney's Pasture near the trendy Westboro neighbourhood, with an underground tunnel through Ottawa's downtown core. Construction has continued for the past five years and the project is set to come online later this summer. The impact the LRT system will have on the housing market is already palpable, according to Mr. Shaw. "Each community has a chance to do something different. The light rail is going to change some dynamics if you're looking longer term," he says. "The light rail is going to dramatically affect [some neighbourhoods]." 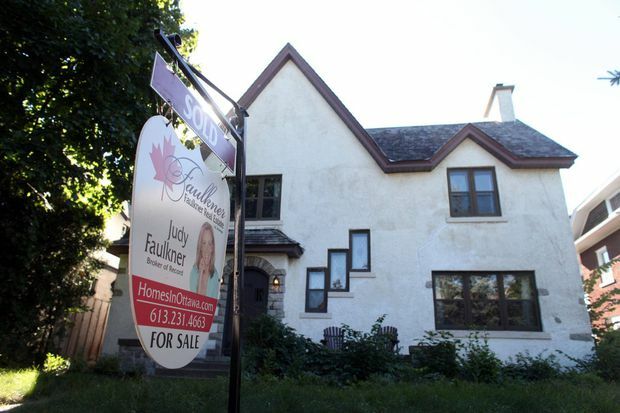 According to Mr. Kavcic, Ottawa's real estate market is showing no signs of slowing down. While he wrote it was primed to 'break out' in 2017, it will grow further still in 2018. "The trends we've seen the last two years or so are probably going to run on for quite a bit longer still," he says.